Debuts at SPIEL 2016, in Europe in late October & in the U.S. in November 2016. 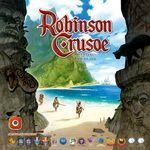 This new edition of Robinson Crusoe: Adventures on the Cursed Island features custom wooden pieces, thick cardboard character cards, over 450 edits on the cards to improve clarity, a standard-sized square box, a seventh scenario, and an all-new English rulebook based on the excellent German edition. Portal Games has also updated the cover illustration with new artwork from Vincent Dutrait to help customers identify the new version of the game from previous editions.